Naples Florida has some of the best beaches in the world. Here are some of the more popular spots on the Gulf of Mexico. NAPLES BEACH AND PIER: From tourist, to sunbathers, to fisherman to shell collectors, they all gather at the pier to witness the greatest sunsets in the world.You'll find a concession stand along with a bait shop for the fisherman. Located at 12th. Street and Gulf Boulevard. NORTH GULF SHORE BOULEVARD BEACH: Located at the end of Seagate Drive, this is a great stretch of beach to enjoy the sand, surf and sun. LOWDERMILK PARK: This park has had a renovated pavilion completed recently with concession stand and picnic tables under the gazebos. DELNOR-WIGGINS STATE PARK: Located at the end of Immokalee Road going west, this is a large state park with all the amenities including a boat ramp. You can watch the boats coming into Wiggins Pass while you swim or fish. 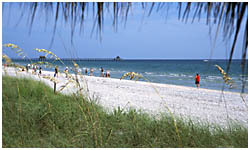 GULFSHORE BLVD: There are many entrances to the public beaches from the side streets west of Gulfshore Blvd.